Ok I'm a little disappointed I didn't get more guesses than I did. The folks that did guess were right on, with the exception of a certain guitar player I know. DOH! Our winner is non other than J.D. Roth. J.D. has just about caught up with Steven for the most wins, no I don't keep stats. Maybe I should? Anywho J.D. just so happened to have posted the movie line and the answer on his page yesterday morning, before making his guess, how weird is that? Congratulations J.D! This is one of those movies that was picked up when a group of guys would get together back in high school. It rates right up there with Strange Brew. I missed last week because I just couldn't find the time or brain power to post one. I've spent the better part of four years allowing my hair to grow unchecked. My poor wife has been a good sport and put up with it, today that all changed. 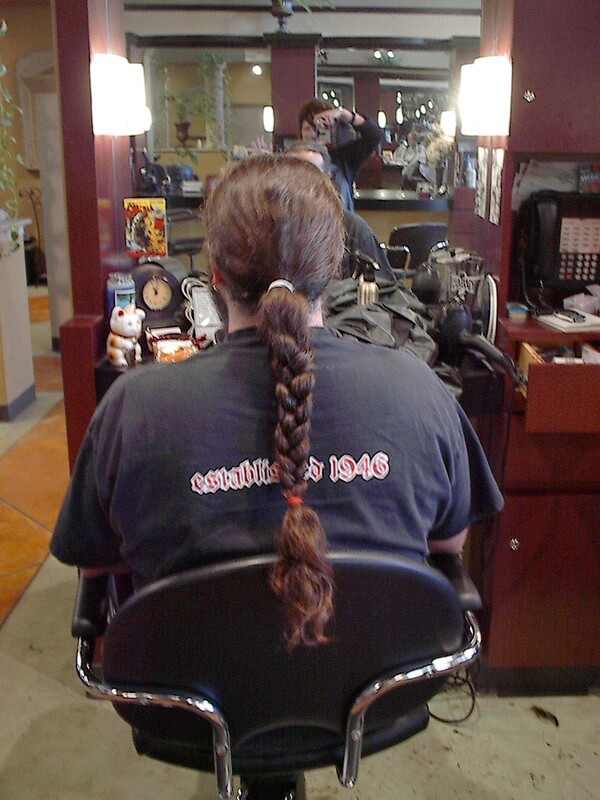 I went to the gal that does my wife's hair and cut about a foot and a half off. Yep, it's all gone. My wife is thrilled, this is a good thing! 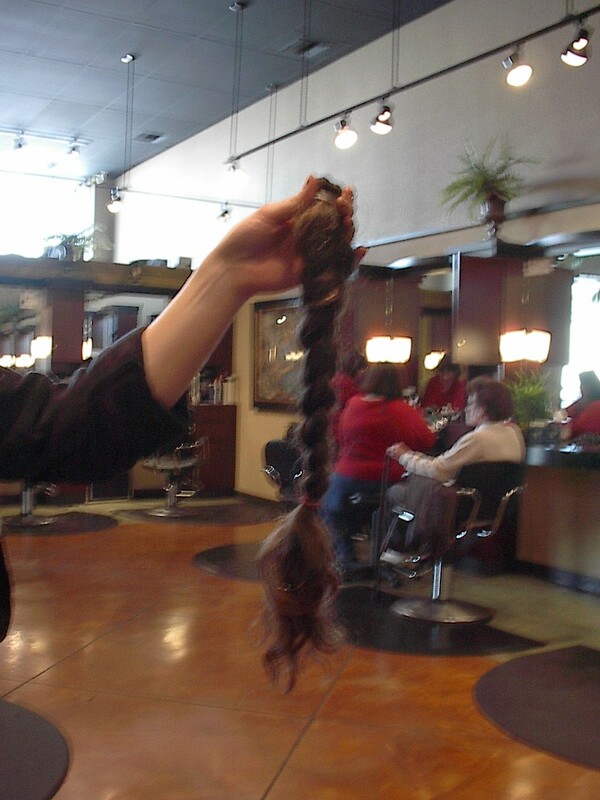 I'm donating it to an organization that creates hairpieces for children suffering from long-term medical hair loss. That organization is called Locks of Love. One day this week or next I'll be sending my rather long pony tail to Florida to be transformed into a nice hairpiece for someone in need. Friends and family will no longer recognize me, especially after I shave the beard! I had a dream last night we open sourced VBA. That's just plain strange isn't it? So I checked this morning and you still have to license it. This is what happens when your work revolves around a certain technology. Some folks would dream about protocols, others about languages. Me, I dream about VBA. Based on that can you guess what new feature of Visio I've been working on for the past year? Yesterday I was treated to a new intranet site devoted to blogging here at Microsoft. Apparently it's being powered by Chris Anderson's BlogX and a lot of folks are beginning to use it. A guy I used to work with, that's since moved on to another group, is using it as a way to spread knowledge about the .NET framework. That's EXACTLY what I'd use if for on the inside. It's a perfect application of a blog. Personally I'd like to see weblogging on our Visio development site. It would be a great way to share status reports, new additions to the codebase, and answers to common questions. If I want to do something like that now I have to create a Word document and add it to a collection of documents via SharePoint, which isn't bad it's just extra steps. I'd like to open up to a browser interface and start banging out what I want to say, publish it, and have an RSS feed generated for it. Easy! Ok Chris how do I configure BlogX for an intranet site? I'm going to stir the pot on the Visio intranet site and see if we can't get some blog action started! Just checked out The Daily Prophet and found a nice little nugget on Prisoner of Azkaban filming. It has a complete rundown on the new actors along with their most recent films. Of particular interest to me is the bit on David Thewlis stating Timeline as a recent film. That's a must see when it releases! I love Michael Crichton novels. They're easy to read and when you're flying it's nice to have something to keep you occupied. I'm currently plowing my way through Prey. Nanotechnology scares the pants off me, at least the kind portrayed in the book. Steven Vore sent me an e-mail this morning with a link to a picture he took while staying at the EdgeWater in Seattle. Yep they still have those little bear foot stools in the rooms. DaveNet: "PS: Seeya in Boston!" - The final California authored DaveNet for a while. Good luck Dave, it seems like an exciting time. A cross-country voyage. Man I wish I could do that! Time to get back in the swing of things. I'm in my office this morning surrounded by my stuff. I work best here. Time to kick this pig and force it down the home stretch! Yee-haw! Wassup with StronglyTyped? I can't see it this morning? RSS feeds are back! You don't know how much I missed them. They've really changed the way I surf and interact with the web. So much information in such a nice compact form. Sure I still visit the sites, but now I do it when I see something that really grabs my attention. It's nice. It's always nice to return home. Every time I go on a trip I come back energized in a certain way. I'm grateful to be able to come home to my wonderful family, as they say absence makes the heart grow fonder. Things are so different in Seattle now. There's a lot going on, and not much of it is what I'd call good. There's a certain energy missing from our little group of code slingers and techsters. There's so much I want to talk about but we'll save that for another day, after my brain and body are rested and I can think again. I took the weekend off. Friday was filled with travel, Saturday I tried to catch up on stuff around the house, and Sunday was church in the morning and piddling around the house some more before coming to my office to start a build so I can start running again tomorrow. Two days off feels nice right about now. I needed it. The Valley is springing to life. The last two days have been in the low 70's and all I want to do is stay home and work in the yard and enjoy the evening out on the porch. That time is coming. Catch you tomorrow, my build is almost at a point where I can go home.